The side dish. The important meal-balancing decision made every night. Typically the protein is the more detailed and time consuming factor of the entree. Most of the thought for deciding on what’s for dinner revolves around the main portion of the plate and once that’s chosen you fall to the accompaniments. What goes well with….? I like foods well prepared and seasoned, but that take little effort. Typical sides in my house are veggies. I like my kids to eat plenty of good vegetables everyday. Luckily they eat their vegetables well, though don’t vary much in the variety they like. No complaining here though because my little ones will gladly eat broccoli, green beans and peas. My daughter always asks for broccoli to make sure we aren’t having her most detested carrots or lima beans. Of course, sometimes it is time for a change. Since our staples are broccoli, green beans and peas, I’ve gotten so used to them I can make them multiple ways each with my eyes shut. Sometimes though, dinner needs a little something different. It is odd looking and may seem tricky to cook, but it is so simple. One minute of prep time is all it takes. Preheat oven to 350 degrees. 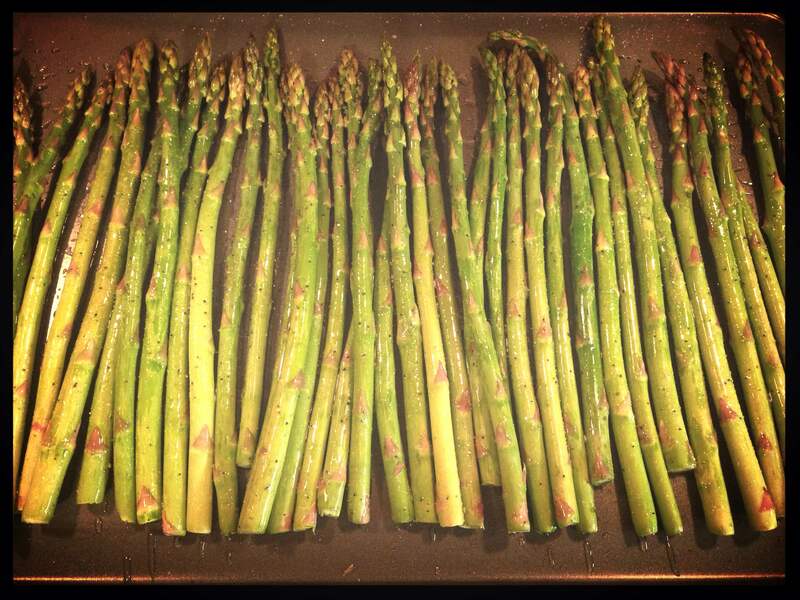 Begin with the asparagus in the bundle. In all the stores I’ve seen it is always bound with 2 blue rubber bands. leave them in place and set laying down on a cutting board. Scoot the bottom rubber band towards the end. With a large sharp kitchen knife cut about 2.5 inches of the stalky ends off. They should be all bundled up inside the rubber band to make disposal (or saving to make a veggie broth) easy cleanup. Transfer the tops to a cookie sheet and spread out. (oh yeah, you can remove the other rubber band now). Drizzle with the olive oil. Sprinkle with seasoning. 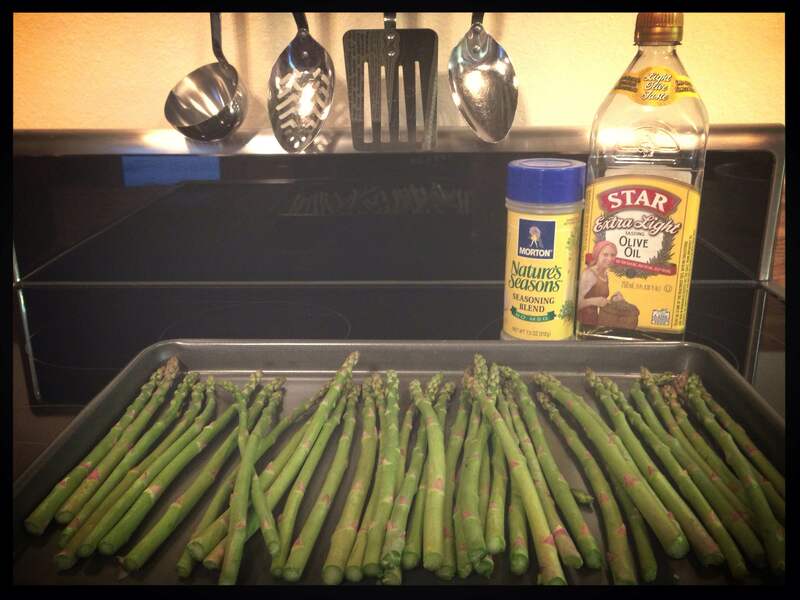 Toss and roll the asparagus spears around the pan until all coated with olive oil and seasoning. Add more of either to taste. Place in oven for roasting for 5-10 minutes. 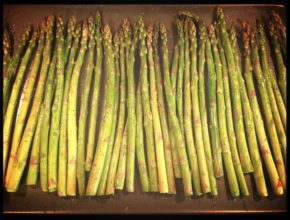 The timing will depend on the thickness of the asparagus you purchased. The ones pictured took about 6 minutes. Thicker stalks will take closer to the 10 minute mark. You want them cooked, but still a bit crisp. If your other dishes are being prepared in the oven I pop the asparagus tray in during the last 5 minutes of cook time. If they need more cooking once the timer goes off I just turn off the oven and leave them in the heat while I prep the plates and it is usually perfect timing! It can be expensive, but it is worth it. The freshness and whimsy it adds to the plate will elevate the class of any daily dish. I like to make it with steak, meatloaf and any other time I happen to notice it on sale. Give it a try! Side dishes may get less tender lovin cookin, but they should still be tasty. Something this simple is almost too good to be true. Believe me it is true and it is oh so good! And yes, my daughter eats them too in case you were wondering, though she prefers broccoli. Proud mama moment right there! My kid loves broccoli! I did something right! Is this recipe easy or what? Do you have any easy go-to sides for your family?